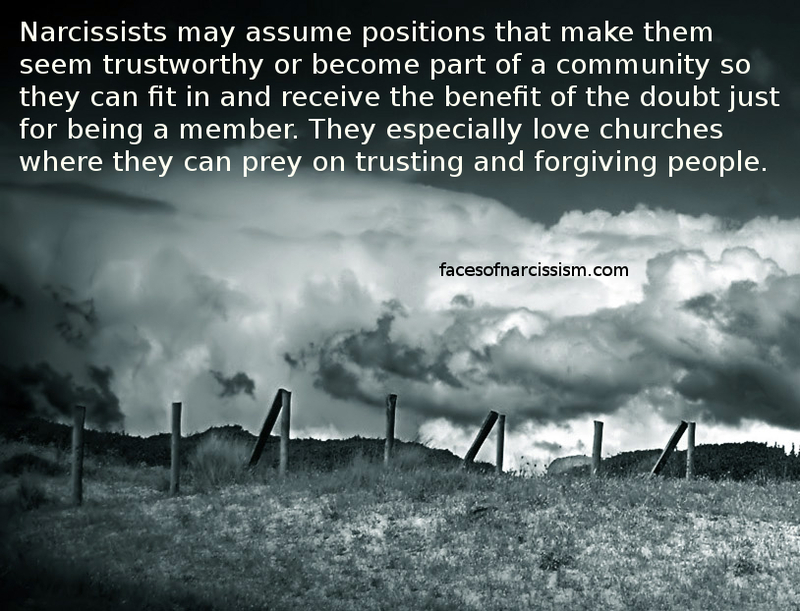 Just a head’s up: this is a post about narcissists and churches, but I am not pushing or attacking religion. I am posting about narcissists and the damage they do by abusing religion, as well as my frustration with the way they manipulate naive people. I was raised Christian in a family of extremely abusive “Christians” who rival the Westboro Church for hypocrisy and hatred. But, I also attended Christian schools for a while and met some genuinely good people. Because of the good ones, and the things I was taught about Christ being caring and loving, I wrongly trusted that most Christians truly were Christ-like. A while back, I wrote a blog about how this naive belief led me to trust the wrong people who were often very harmful and hurtful to me. Instead of looking at them to see if they were trustworthy, I just assumed they were because of their “Christian” label. Bad idea! People of Christian or other religion, (or any club,) tend to support each other. Just like women from the same sorority often find a bond with strangers from the same sorority, so do people of faith. Oh you are a Christian too? Well, then we are like-minded people! Oh you are a member of this club? Well great to meet you! Even with people we’ve never met, we have common ground with people from the same organizations, and we let down our guard a bit. If Christy was in Alpha Chi Omega, she must be a good person! (I have no idea of that’s a real sorority, by the way!) We identify with people who share our groups and assume that they have the good intentions we have. This is especially dangerous when a narcissist or another predator realizes what value there is in joining a religious group. A narcissist in a church–especially as a leader–has a ready and willing audience of vulnerable people to choose from. When I was a kid, my mother would go out of her way to support businesses that self-identified as Christian. There was a car mechanic that consistently ripped us off, but she kept going to him. Even when she spent hundreds of dollars that didn’t fix the problem, and another mechanic alerted her that the expensive part she’d paid for had never been replaced, she still went back to the bad mechanic because he had a Bible in his window. When asked why she kept going back to be conned again, she insisted that the Bible mean the mechanic was a good guy. Later, she had a very bad experience with a realtor. It is a long story, but she got scammed badly and just kept going with it even when more astute people were warning her to stop. All because the realtor talked about being a Christian. I came to distrust anyone who was selling their religion to get customers. It sure looked like a way to attract suckers to me! When I was at my lowest point, a retired pastor told me I needed to stop inventing fake problems and airing my dirty laundry. I was stressed out, depressed and suffering from PTSD while wondering if life was worth living when this guy made hateful, blaming comments to me and almost pushed me over the edge. I guess my ex sociopath spouse who violently attacked my toddler, assaulted me when I was pregnant, smeared me everywhere he went, hacked into my accounts, sent people to stalk me, refused to pay child-support while I struggled, and more, was not a “real” problem? Like a good woman I was supposed to shut up and take it? I’d been abused by many Christians through my life, but still assumed that most were trustworthy until that day. It was a breaking point for me when I realized that not everyone who claims to be a Christian is even a decent human being–not even a pastor. When I got to thinking, I realized that pastor bragged about how good he was but never once showed a hint of empathy or kindness for others. He was just extremely self-righteous. That was an eye-opening experience, and a reminder that I shouldn’t trust people for what they pretend to be. Instead, I need to watch and see who they are. Fortunately, the nastiness of the pastor made me so mad, it snapped me out of my suicidal thoughts. If there is a Satan, he is alive and well in the church doing a lot of damage to hurting people through pastors like that one. I’m sure I’m not the only person who has turned away from the church specifically because a wolf in sheep’s clothing abused or bullied us. I’m sure I’m not the only person who has been violently abused by Christians. I’m sure I’m not the only one who has been let down by trusting people who talk the talk then back stab us. There is a lot of destruction done in the name of false Christians. I don’t blame all Christians or religious people or group members for the actions of the predators who hide among them, but I have learned that, if we want to be part of such organizations, we have to realize that they have a high percentage of predators. Will the flying monkeys ever learn the truth? Will they ever be sorry? Dear Joanna and Friends, which is why Jude wrote that short letter about people “creeping” in amongst the real Christians. He was going to write about something else, but apparently he had gotten word about some bad stuff going on. Yeah, the Church is alot safer for wicked people to play their games, than is a smoky barroom. Unfortunately, you speak the truth about these predators in the churches. I was married to one of them. In addition we “counseled” with an elder who sided with the narcopath. (probably one himself) When I said that I couldn’t go any farther unless the narcopath got help and stopped drinking (he is a raging alcoholic), I was told “what if he put demands like that on you?” I was basically told to just go home and submit and make the narcopath happy. So, yeah. This article is just fantastic. More people, whether Christian or not, need to read it. Thank you for writing it. of course narcissist and psychopaths love churches and target them, where else would people put up with them? I’ve known one who speaks at Churches about Ultra Sound. He lies and says his Sons. Died of a heart attack.There were two Sons who died but a heart Attack is far from the Truth. Try Drug overdose and complication from a surgery, but it puts money in his pocket. He doesn’t. Care it you know the truth. I really needed to read this. I grew up in the Church and a Christian school, and I agree with you 100%. I have been bullied throughout my life by so called believers. I feel completely broken and discouraged by my experiences. I also feel like a failure for being angry at them, and not trusting people. I need help and I need encouragement to push forward in my faith. and now I just laugh in their faces and take the piss out of them.